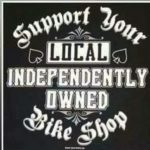 Everything for your Motorcycles . From Locals, for Locals. The BikerStrap is the Best Alternative to the bungee net. Welcome to BRIGIT’S CUSTOM WORKS! The Weather in Beautiful Daytona Beach !! Looking for that SPECIAL Part for your Harley or Custom Bike ???? We are YOUR dealer for most American and foreign Manufacturers.